There are many huge—and hugely popular—churches in Paris that make it onto most tourists’ must-see lists: Notre Dame, Sacre Coeur, Saint Sulpice, etc. 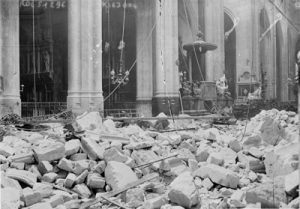 But the City of Light is home to more than 125 churches, and some of the most interesting and most beautiful are among the less-popular and out-of-the-way houses of worship. 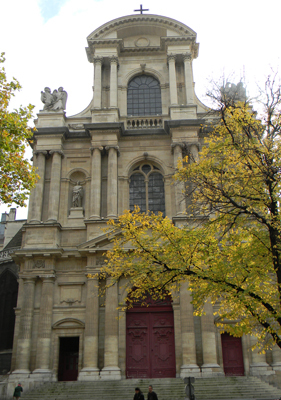 One of my favorites of these less-visited sites is also one of the oldest churches in Paris (it’s roots going back to the 4th century)—Saint Gervais-Saint Protais, located just east of Hotel de Ville in the 4th Arrondissement. Named after Saints Gervasius and Protasius, 2nd century Roman officers turned Christian Martyrs, the current structure—built on the site that has hosted a church since the mid-300s, more than 1,700 years—was started in the in 1494, and was added to regularly in the 1500s and 1600s. Its Classical facade, somewhat of a rarity in Paris, was completed around 1620, and includes Doric, Ionic and Corinthian columns. 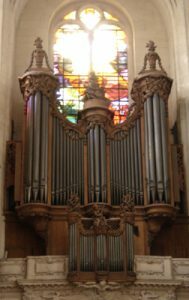 Saint Gervais-Saint Protais is also known for its French Baroque pipe organ, built in the early 1600s by the renowned Clicquot family of craftsmen and still in use today. 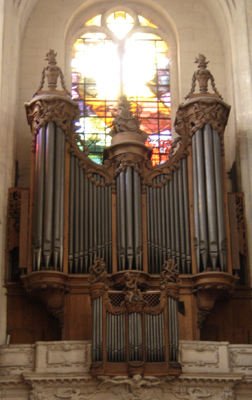 The church is notable for three other historic events: Serving as home and employer for nearly 200 years to the Couperin family of renowned musicians (many of whom played the church organ); the installation of a number of exquisite stained glass windows by Claude Courageus and Sylvie Gaudin to mark a visit by Pope John Paul II in the 1980s; and for being nearly destroyed in 1918 during World War I when a German shell fired from a long-range gun slammed into the church during Good Friday mass, killing 88 people and wounding 68 others. This was the highest number of civilian casualties from any one event during the entire war. A small square in front of the church, Place Saint-Gervais, is lined with elm trees and is remarkably hushed and tranquil, despite being just a block from Paris’s bustling Hotel de Ville (City Hall) and the always-jam-packed Rue de Rivoli. The square was once called Carrefour de l’Orme (Crossroads of the Elm). 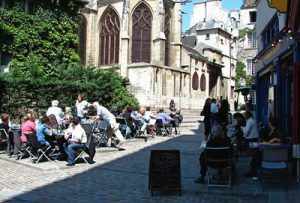 And behind the church, the pedestrian-only Rue des Barres hosts a delightful restaurant, L’Ebouillante, which operates a hugely popular terrace literally in the shadow of Saint Gervais-Saint Protais during warm weather. Show up early if you want to grab a table for lunch, as the terrace is a favorite destination for locals and visitors alike. Saint Gervais-Saint Protais is located at 13 Rue des Barres (Metro: Hotel de Ville/Pont Marie). The church is free and open to the public Monday-Friday 6 a.m.-9 p.m., and Saturday and Sunday 7 a.m.-9 p.m. This entry was posted in Beauty of Paris, Churches, Hidden Paris, Marais, Right Bank, Sight-seeing and tagged Hotel de Ville, L'Ebouillante, Rue de Rivoli, Rue des Barres, Saint Gervais-Saint Protais by Bob Adams. Bookmark the permalink.